One recent steamy Saturday morning, Rose is greeting cars as they line up at the entrance. She says this isn’t uncommon. Since 2008, the number of annual park visitors has jumped 127%, from about 72,000 visitors to more than 163,000 last year, according to the Texas Parks and Wildlife Department. The swell in visitors is having a negative impact on the park’s natural and cultural resources, according to Rose. 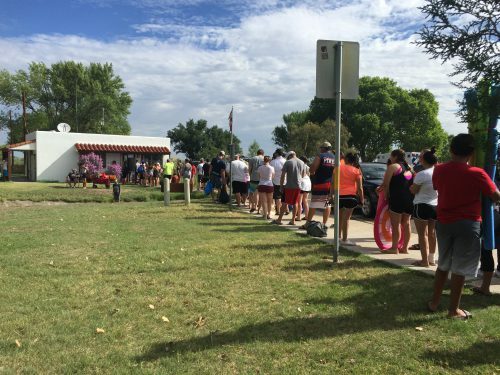 In May, Balmorhea State Park began limiting visitors to 1,300 people a day. A thousand people are allowed entry in the morning, and 300 more are given tickets to enter the park at 3pm. Weekends have gotten so busy, that the park now updates its capacity on Facebook and Twitter. Ashley Duvall traveled to Balmorhea from Midland. She’d been checking the park’s social media status updates, but that didn’t prevent her and her friends from waiting an hour and 15 minutes to gain entry to the pool. Storms the night before had made the park’s computer system slower than usual. “It has been a long wait, I’m not going to lie,” she says. She’d even unpacked her lounge chair, sitting while she waits. While swimming alone doesn’t have a negative impact on the park’s natural resources, it’s the other things that visitors do that are the problem. 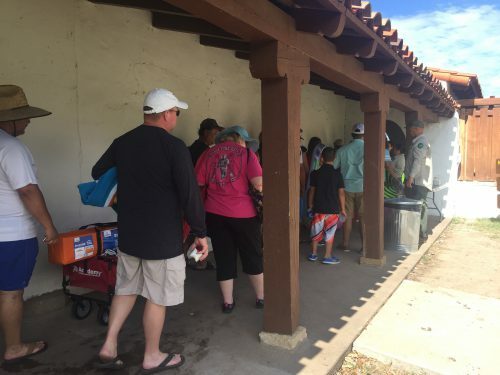 According to Superintendent Carolyn Rose, visitors have strung up hammocks on the columns of historic pagodas built in the 1930s, dumped charcoal on the roots of cottonwood trees, and caught the park’s rare and protected headwater catfish in zip lock bags. 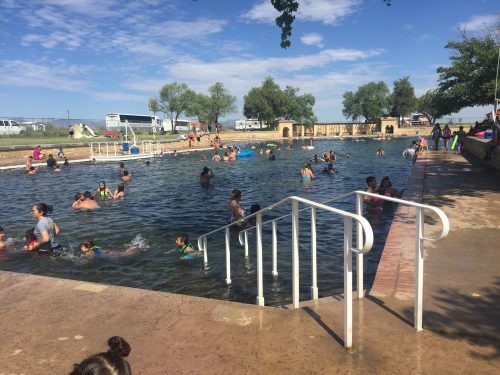 Children and dogs are let loose to splash in the park’s canal system, which is protected habitat for the park’s two species of endangered fish: the Pecos gambusia and the Comanche Springs pupfish. Wesley Pool – yes, that’s his real last name – stands by the pool’s edge, a dripping wetsuit pulled halfway down his chest. He’s been traveling to Balmorhea from his home in Clovis, New Mexico for the last 10 years, to scuba dive in the clear blue waters. He says he likes to interact with the fish he sees at the bottom. But there are plenty of people like Pool that simply aren’t aware that what they’re doing is wrong. That’s why Texas Parks and Wildlife plans to make educational outreach a priority. Once the peak summer months are over, their goal is to educate the public about preserving the park. Educational initiatives have been key to limiting human impact at other natural pools in the state. Wayne Simmons is the Aquatic Program Manager for the City of Austin’s Parks and Recreation Department. He says that Barton Springs – another famous Texas watering hole – can receive anywhere from 2,000 to 10,000 guests a day. But because of their educational initiatives, they don’t see many of the same problems that are taking place at Balmorhea. “When (visitors) see the educational exhibits that we have, and they learn, their eyes open up really wide and it’s like ‘oh okay.’ The light bulb comes on,” says Simmons. While there are similarities, Barton Springs has an army of staff, volunteers, and public support. 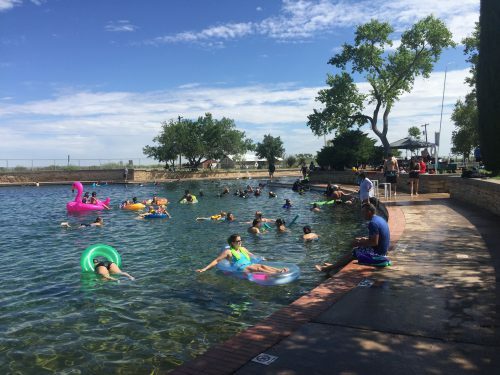 In West Texas, a statewide hiring freeze has left the Balmorhea State Park down four employees all summer long, while public interest just keeps rising. So, for now, Rose is focused on what she can do – and that’s controlling the number of people that enter. This entry was posted in KRTS News, KXWT News and tagged Balmorhea State Park, San Solomon Springs, Texas Parks and Wildlife. Bookmark the permalink.